Build your own LEGO creation and display it at our showcase! If you don't have access to LEGO bricks, come use ours on Thursday April 4th and Thursday April 18th. During the showcase, builders are encouraged to talk about their creations and answer any questions viewers might have! Guidelines will be provided by request. The Spring Session of Preschool Story Time! For ages 3 to 5. Drop in only! This program includes, stories, puppets,dancing, activities, rhymes and crafts! Join us this afternoon for a Spring Art project. Grades 1st through 4th, no reservations necessary. This program is funded by the Friends of the Hazen Memorial Library. Join other Moms/Dads & kids as we explore through music, movement, nursery rhymes, stories, activities and more! This group caters to "Toddlers" but older kids are always welcome. Hosted by the Family Partnership Center. The Science Fiction Book Club meets at 6:00 pm tonight in the Library. 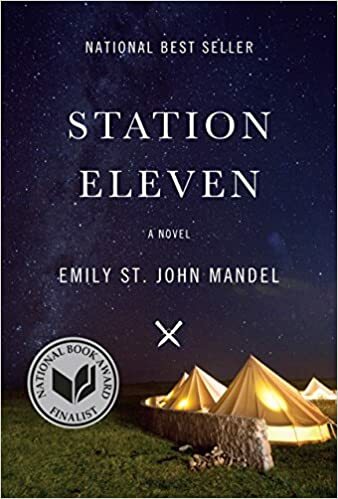 This month's title is "Station Eleven" by Emily St. John Mandel. Call to reserve a copy of the book. Pizza will be served, and new members always welcome. An audacious. darkly glittering novel set in the eerie days of civilizations collapse. Station Eleven tells the spellbinding story of a Hollywood star. his would-be savior . and a nomadic group of actors roaming the scattered outposts of the Great Lakes region. risking everything for art and humanity. One snowy night Arthur Leander. a famous actor. has a heart attack onstage during a production of King Lear. Jeevan Chaudhary. a paparazzo-turned-EMT. is in the audience and leaps to his aid. A child actress named Kirsten Raymonde watches in horror as Jeevan performs CPR. pumping Arthurs chest as the curtain drops. but Arthur is dead. That same night. as Jeevan walks home from the theater. a terrible flu begins to spread. Hospitals are flooded and Jeevan and his brother barricade themselves inside . . . The Goose is back on the Loose this Spring with Drop in for Mother Goose on the Loose! 30-Minute nursery rhyme program for children from birth to age 3. Puppets, songs, fingerplays and musical instruments make for a stimulating time for baby's emergent literacy. No Registration required/No craft involved. Join us for a fun program with Dance Instructor Miss Maria Morrell of Maria's School of Dance. Miss Maria has been instructing dance for 42 years at her Ayer studio. This class is for the youngest movers and dancers! She will combine motor skills with music and song that will meet on the last Thursday of each month. This class is recommended for children ages 2-4. Class size is limited please register at front desk or call 978-425-2620. This program is funded by the Trustees of the Hazen Memorial Library. Certified instructor Sue McCarron will teach some advanced knitting techniques. This FREE class is for anyone who has a good understanding of how to form the knit and purl stitches. Students will learn how to increase and decrease, make ribbing, moss stitch, basketweave stitch, and a basic cable. Students may choose to start a project of their choosing with an appropriate level pattern that student brings to class. What to BRING: one set of knitting needles Size US 8; cable needles; and WHITE or LIGHT colored yarn of medium weight. If using a different weight yarn, bring needles of the appropriate size. This program is sponsored in part by a grant from the Shirley Cultural Council, a local agency which is supported by the Massachusetts Cultural Council, a state agency. The Gardener's Exchange will meet in the Library Meeting Room from 10:30 - 12:30. Join Early Childhood Specialist Nancy Railsback for a morning of music and creative movement. A singer songwriter, she brings her knowledge of young children to early childhood programs providing experiences for singing, expressive movement, as well as opportunities to listen to and play instruments. This program is for children up to age 3 with a parent. Please call 978-425-2620 or stop by at the desk to register. This program is funded by the Hazen Memorial Library Board of Trustees. Join Julie Quirk owner of Studio Q for a morning of Zumbini, which is a 45 minute interactive experience for little ones ages 4 months- 4 years old and their caregivers. Rhythm Sticks! Bongo Drums! Bubbles! Bells! As for his scholarly credentials, Dr. Williams has a PhD in Central Asian Islamic history and is a full professor of Islamic History at the University of Massachusetts Dartmouth (tenure received in 2006, and full professorship 2013) and formerly taught Muslim history at the prestigious University of London. His previous books have been reviewed by the Times, Boston Globe, Wall Street Journal etc., endorsed by former CIA Director General David Petraeus, and one (Predators. The CIA's Drone War on Al Qaeda) was credited by the British rock band Muse in Rolling Stone with inspiring their bestselling, Grammy-winning album "Drones." Previous books have been published by Oxford University Press, Harper Collins, and the military-focused DC-based commercial press Potomac etc. Dr. Williams has testified in terrorism cases at Guantanamo Bay as an expert witness, wrote a manual for the U.S. Army on Afghanistan that was published in a civilian version as Afghanistan Declassified, and recently traveled to the Mosul region in northern Iraq to assist in freeing a Yazidi slave from her ISIS captor. In addition to his fieldwork in the Islamic world which ranges from Bosnia and Kosovo to the remote tribal zones of Pakistan and the Himalayan warzone of Kashmir, Dr. Williams has trained U.S. Marines deploying to Afghanistan on tribal history and has lectured at Special Operations Command, MacDill Airbase, and U.S. Air Force Special Operations Command and worked for the Directorate of National Intelligence on chemical and biological terror threats to the U.S. Professor Williams has also spent time in the Soviet Union and speaks Russian and Turkish. Dr. Williams gives an hour long power point presentation followed by Q&A then book sales and signing. Please join us for this informative and exciting program, sponsored by the Hazen Memorial Library Endowment Fund. The program is free, and light refreshments will be served. Preschool Yoga with Mandy Roberge! Join Mandy Roberge once a month for an exploration of preschool yoga with art, singing and dancing. Please register at the Library as space is limited. This program is funded by the Mind in the Making Grant from a Massachusetts Board of Library Commissioners LSTA Grant. Join us for a program with Dance Instructor Lindsey Lawrence. This class is for the youngest dancers! She will combine Creative Movement and Tumbling that will meet once a month. The program requires only comfortable clothing and socks, no dance shoes required. This class is perfect for children ages 2-4. The class size is limited please register at front desk or call 978-425-2620.